For other uses, see Flores (disambiguation). Flores (Indonesian: Pulau Flores) is one of the Lesser Sunda Islands, a group of islands in the eastern half of Indonesia. The population was 1,831,000 in the 2010 census and the largest town is Maumere. The name Flores is derived from the Portuguese for "flowers". Flores is located east of Sumbawa and Komodo islands and west of Lembata island and the Alor Archipelago. To the southeast is Timor. To the south, across the Sumba Strait, is Sumba island and to the north, beyond the Flores Sea, is Sulawesi. Among all islands containing Indonesian territory, Flores is the 10th most populous after Java, Sumatra, Borneo (Kalimantan), Sulawesi, New Guinea, Bali, Madura, Lombok, and Timor and also the 10th biggest island of Indonesia. Unlike most islands in the Indonesian archipelago, the name Flores was given by the Portuguese, from Cabo de Flores (Cape of Flowers), the Portuguese term for the eastern part of the island. This part of the island, originally called Kopondai, was so named by the Portuguese because of the flowering Delonix regia trees found there. The original name of Flores was Nipa, referring to the serpent. 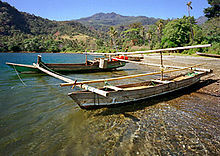 Portuguese traders and missionaries came to Flores in the 16th century, mainly to Larantuka and Sikka. Their influence is still discernible in Sikka's language, culture and religion. The first Portuguese visit took place in 1511, through the expedition of António de Abreu and his vice-captain Francisco Serrão, en route through the Sunda islands. The Dominican order was extremely important in this island, as well as in the neighbouring islands of Timor and Solor. When in 1613 the Dutch attacked the Fortress of Solor, the population of this fort, led by the Dominicans, moved to the harbor town of Larantuka, on the eastern coast of Flores. This population was mixed, of Portuguese and local islanders descent and Larantuqueiros, Topasses or, as Dutch knew them, the 'Black Portuguese' (Zwarte Portuguezen). These [the Topasses] have no Forts, but depend on their Alliance with the Natives: And indeed they are already so mixt, that it is hard to distinguish whether they are Portuguese or Indians. Their Language is Portuguese; and the religion they have, is Romish. They seem in Words to acknowledge the King of Portugal for their Sovereign; yet they will not accept any Officers sent by him. They speak indifferently the Malayan and their own native Languages, as well as Portuguese. In 1846, Dutch and Portuguese initiated negotiations towards delimiting the territories but these negotiations led nowhere. In 1851 Lima Lopes, the new governor of Timor, Solor and Flores, agreed to sell eastern Flores and the nearby islands to the Dutch in return for a payment of 200,000 Florins in order to support his impoverished administration. Lima Lopes did so without the consent of Lisbon and was dismissed in disgrace, but his agreement was not rescinded and in 1854 Portugal ceded all its historical claims on Flores. After this, Flores became part of the territory of Dutch East Indies. During World War II a Japanese invasion force landed at Reo on 14 May 1942 and occupied Flores. After the war Flores became part of independent Indonesia. In 2017 two men were killed in Flores due to land disputes between warrior clans; the Mbehel, a West Maggarai mountain tribe, and the Rangko from Sulawesi island who helped build Manggarai and were given land near Labuan Bajo by the Manggarai king. Flores is part of the East Nusa Tenggara province. The island along with smaller minor islands are split into eight regencies (local government districts); from west to east these are: Manggarai Barat (West Manggarai), Manggarai Tengah (Central Manggarai), Manggarai Timur (East Manggarai), Ngada, Nagekeo, Ende, Sikka and Flores Timur (East Flores). Flores has 39.1% of the East Nusa Tenggara provincial population as of 2010[update], and the most Indonesians of all islands in the province. The west coast of Flores is one of the few places, aside from the island of Komodo itself, where the Komodo dragon can be found in the wild, and is part of Komodo National Park, a UNESCO World Heritage Site. Kelimutu National Park is the second national park designated on Flores to protect endangered species. The Flores giant rat is also endemic to the island, and Verhoeven's giant tree rat was formerly present. These giant rodents are considered examples of island gigantism. Flores was also the habitat of several extinct dwarf forms of the proboscidean Stegodon, the most recent (Stegodon florensis insularis) disappearing approximately 12,000 years ago and the diminutive Homo floresiensis. It is speculated by scientists that limited resources and an absence of advanced predators made the few megafaunal species that reached the island subject to insular dwarfism. The presence of Trigonoceps vultures indicates that the island bore mammalian carnivores at some point. In September 2003, at Liang Bua Cave in western Flores, paleoanthropologists discovered small skeletons that they described as a previously unknown hominin species, Homo floresiensis. These are informally named hobbits and appear to have stood about 1 metre (3.3 feet) tall. This hominin had originally been considered to be remarkable for its survival until relatively recent times, only 12,000 years ago. However, by 2016, more extensive stratigraphic and chronological work has pushed the dating of the most recent evidence of their existence back to 50,000 years ago. There are many languages spoken on the island of Flores, all of them belonging to the Austronesian family. In the centre of the island in the districts of Ngada, Nagekeo, and Ende there is what is variously called the Central Flores Dialect Chain or the Central Flores Linkage. Within this area there are slight linguistic differences in almost every village. At least six separate languages are identifiable. These are from west to east: Ngadha, Nage, Keo, Ende, Lio and Palu'e, which is spoken on the island with the same name of the north coast of Flores. Locals would probably also add So'a and Bajawa to this list, which anthropologists have labeled dialects of Ngadha. The peoples of Flores are almost entirely Roman Catholic Christians, whereas most other Indonesians are Muslim. As a consequence, Flores may be regarded as surrounded by a religious border. The prominence of Catholicism on the island results from its colonisation by Portugal. In other parts of Indonesia with significant Christian populations, such as the Maluku Islands and Sulawesi, the geographical divide is less rigid and Muslims and Christians sometimes live side by side. Flores thereby also has less religious violence that has sporadically occurred in other parts of Indonesia. There are several churches on the island. The most famous tourist attraction in Flores is the 1,639-metre-high (5,377-foot) Kelimutu volcano which containing three colored lakes, located in the district of Ende close to the town of Moni, although you can also visit Inierie vulcano near Bajawa town. These crater lakes are in the caldera of a volcano, and fed by a volcanic gas source, resulting in highly acidic water. The colored lakes change colors on an irregular basis, depending on the oxidation state of the lake from bright red through green and blue. There are snorkelling and diving locations along the north coast of Flores, most notably Maumere and Riung. However, due to the destructive practice of local fishermen using bombs to fish, and locals selling shells to tourists, combined with the after effects of a devastating tsunami in 1992, the reefs have slowly been destroyed. Labuan Bajo town located on the western tip is often used by tourists as a base to visit Komodo and Rinca islands. Labuan bajo also attracts scuba divers, as whale sharks inhabit the waters around Labuan bajo. The Luba and Bena villages include traditional houses in Flores, Bena is also noted for its Stone Age megaliths. Larantuka, on the isle's eastern end, is known for its Holy Week festivals. In recent years, local tourist firms around Kelimutu have begun promoting cycling tours around Flores, some of which take up to five or six days depending on the particular program. In addition to tourism, the main economic activities on Flores are agriculture, fishing and seaweed production. The primary food crops being grown on Flores are rice, maize, sweet potato and cassava, while the main cash crops are coffee, coconut, candle nut and cashew. Flores is one of the newest origins for Indonesian coffee. Previously, most Arabica coffee (Coffea arabica) from Flores was blended with other origins. Now, demand is growing for this coffee because of its heavy body and sweet chocolate, floral and woody notes. Gewayantana Airport close to Larantuka city. ^ a b "Out of the Ashes - Chapter 1". Epress.anu.edu.au. 1914-06-25. Retrieved 2012-07-25. ^ L, Klemen (1999–2000). "The Lesser Sunda Islands 1941-1942". Forgotten Campaign: The Dutch East Indies Campaign 1941-1942. ^ "Subscribe to The Australian - Newspaper home delivery, website, iPad, iPhone & Android apps". Theaustralian.com.au. Retrieved 17 October 2018. 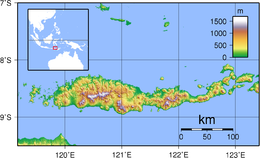 ^ Flores Timur District includes islands like Adonara and Solor to the east of Flores. ^ "Hasil Sensus Penduduk 2010". Ntt.bps.go.id. Retrieved 2012-07-25. ^ Van Den Bergh, G. D.; Rokhus Due Awe; Morwood, M. J.; Sutikna, T.; Jatmiko; Wahyu Saptomo, E. (May 2008). "The youngest Stegodon remains in Southeast Asia from the Late Pleistocene archaeological site Liang Bua, Flores, Indonesia". Quaternary International. 182 (1): 16–48. doi:10.1016/j.quaint.2007.02.001. Retrieved 27 November 2011. ^ "Hobbits" Were Pygmy Ancestors, Not New Species, Study Says, National Geographic, 21 August 2006. ^ Baab, Karen L.; Kieran P. McNulty; Katerina Harvati (10 July 2013). "Homo floresiensis Contextualized: A Geometric Morphometric Comparative Analysis of Fossil and Pathological Human Samples". PLoS ONE. 8 (7): e69119. doi:10.1371/journal.pone.0069119. PMC 3707875. PMID 23874886. ^ Sutikna, Thomas; Tocheri, Matthew W.; Morwood, Michael J.; Saptomo, E. Wahyu; Jatmiko; Awe, Rokus Due; Wasisto, Sri; Westaway, Kira E.; Aubert, Maxime; Li, Bo; Zhao, Jian-xin; Storey, Michael; Alloway, Brent V.; Morley, Mike W.; Meijer, Hanneke J. M.; van den Bergh, Gerrit D.; Grün, Rainer; Dosseto, Anthony; Brumm, Adam; Jungers, William L.; Roberts, Richard G. (30 March 2016). "Revised stratigraphy and chronology for Homo floresiensis at Liang Bua in Indonesia". Nature. 532 (7599): 366–369. doi:10.1038/nature17179. hdl:1885/109256. PMID 27027286. ^ Pasternack. Keli Mutu Volcanic Lakes, University of California Davis. ^ Markus Makur, 'Bycycle tours of Kelimutu boost local economy', The Jakarta Post, 13 March 2016. ^ East Nusa Tenggara, Indonesian Chamber of Commerce and Industry. Retrieved 8 August 2008. ^ Arabica Producing Regions of Indonesia, Specialty Coffee Association of Indonesia. Retrieved 8 August 2008. L, Klemen (1999–2000). "Forgotten Campaign: The Dutch East Indies Campaign 1941-1942". Archived from the original on 26 July 2011. Wikivoyage has a travel guide for Flores (Indonesia).